A fisherman has discovered what appears to be a shark with a single eye in the centre of its face. The albino ‘cyclops’ fetus was cut from the belly of a pregnant bull shark caught in the Gulf of California this summer. The one-eyed shark has achieved cult status since Pisces Fleet Sportfishing published pictures of it in July, giving rise to rumours of Photoshopping or other hoaxes. But shark researchers who have examined the creature say it is genuine, although it is unlikely it would have survived after birth, MSNBC reports. 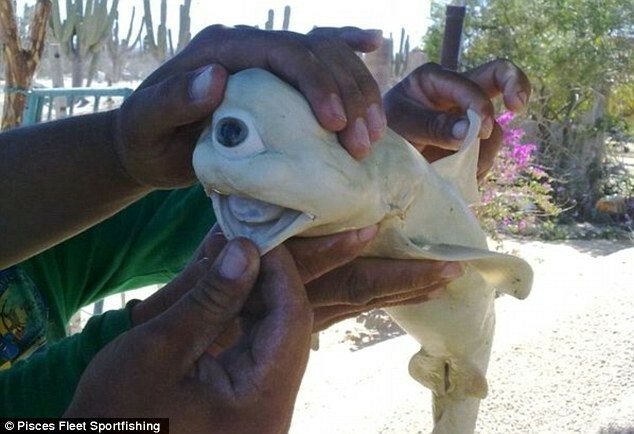 The shark’s condition is known as cyclopia, and is a rare congenital disorder characterised by the failure of the front portion of the brain to properly divide the orbits of the eye into two cavities. In 2005 a kitten born with only one eye and no nose caused a similar online stir. That’s as much interesting as it is freaky. My dad was telling me just the other day about how he seen on TV were they found some albino cyclops shark in the stomach of a Bull Shark, but I had no idea I’d get a chance to see a picture of it a few days later. Thanks for posting this… I forgot to search online for it when I first heard about it, so I most likely would have forgot and never found it if I didn’t visit http://thefreaky.net on occasions.